All QCWA Members may attend! Dutch Treat - Everyone is Welcome! Saturday May 18th, at 1340 EDT in Forum Room #4. 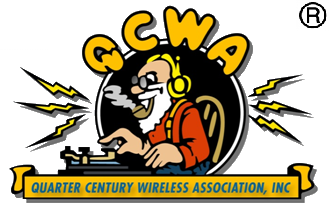 The Quarter Century Wireless Association, Inc. 2380 Mohansic Ave., Yorktown Heights, NY 10598 (QCWA) pursuant to NY.s N-PCL §605(a) hereby gives notice of the annual meeting to be held at the Greene County Fair Grounds and Expo Center, 210 Fairgrounds Rd., Xenia, OH 45385 in conjunction with the QCWA Forum at the Dayton Hamvention® on Saturday, May 18, 2019 at 1:40 PM (EDT) to present its annual report in accordance with the provisions of NY.s N-PCL §519 and to transact such other business as may properly come before the meeting or any adjournments or postponements thereof. Dated: April 25, 2019.